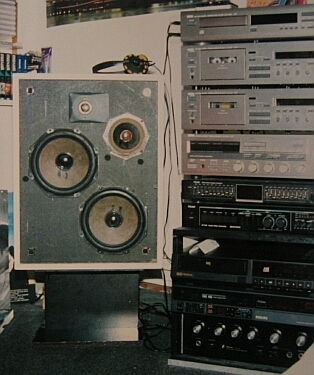 In this section you’ll find the history of my personal audio setups as they evolved through the years. 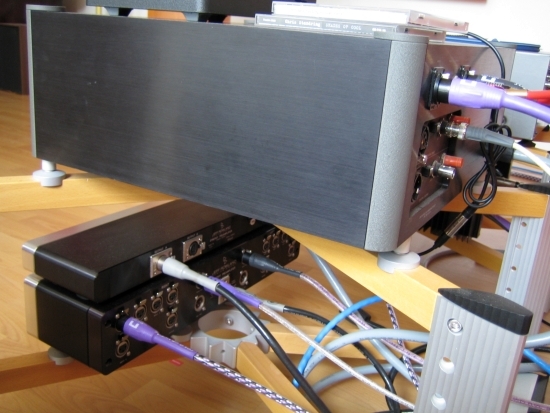 In the beginning it was just for fun but pretty soon the setups started to function as reference systems for judging other audio components’ performance. Main picture above: this must have been somewhere around 1976. 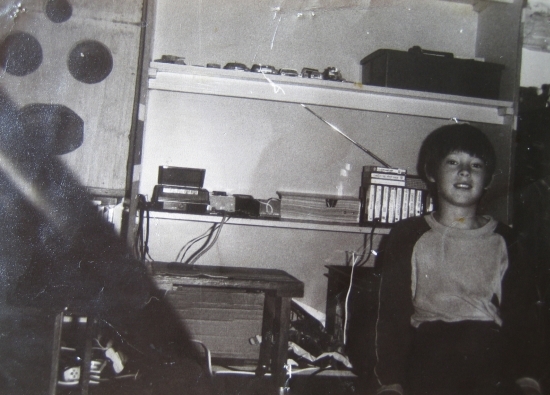 This is me with a radio glued to my ear: the fascination really was there early on. 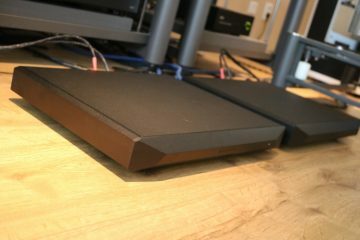 My first real hifi setup, component wise. 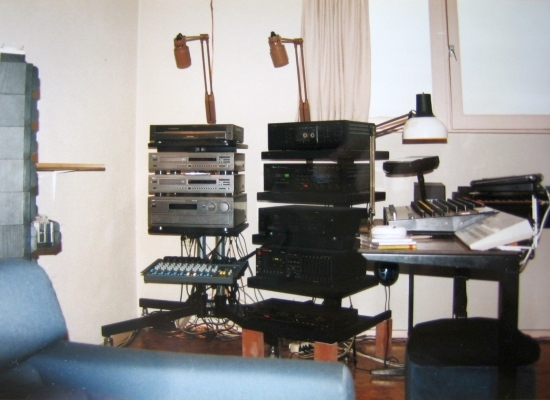 I was crazy about Yamaha equipment at the time. The pile just had to be higher and higher… The speakers were still below par although these Philipses, if not highend, really weren’t bad at all. The tweeters were damaged and had been replaced by 25 euro JBL’s as I couldn’t afford better alternatives. Alas this changed their sound for the worse. Early nineties. 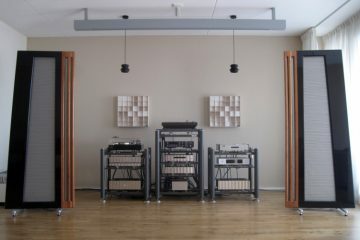 Left: The two racks of equipment at the time that I wasn’t strictly speaking an audiophile yet. 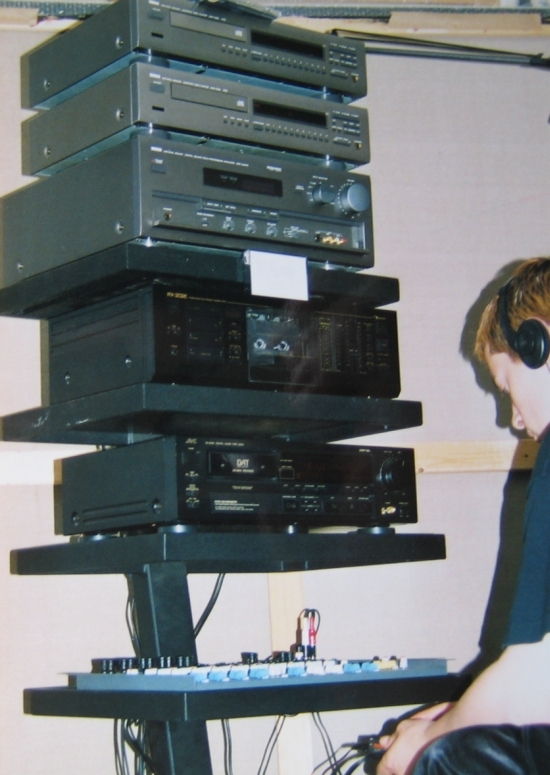 Young me listening to a Sony MZ-R30 Minidics Recorder through a Spirit Folio (Soundcraft) mixing desk, selecting tracks to be copied. 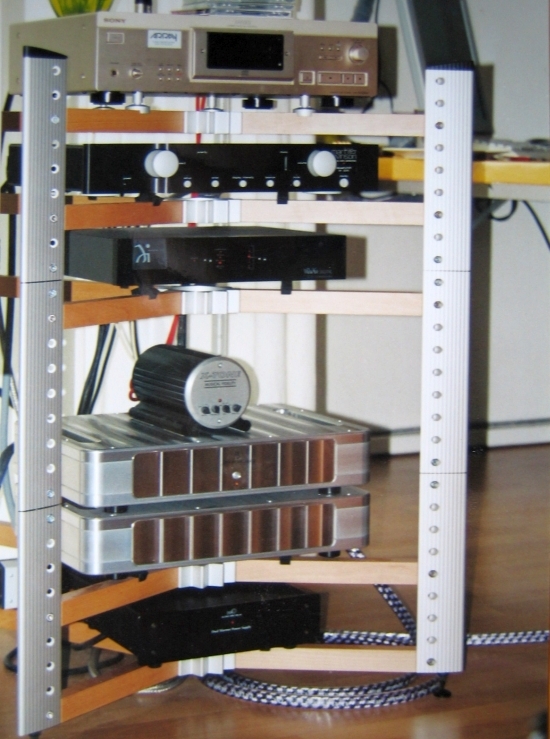 Deck Rack – My pride and joy at the time! 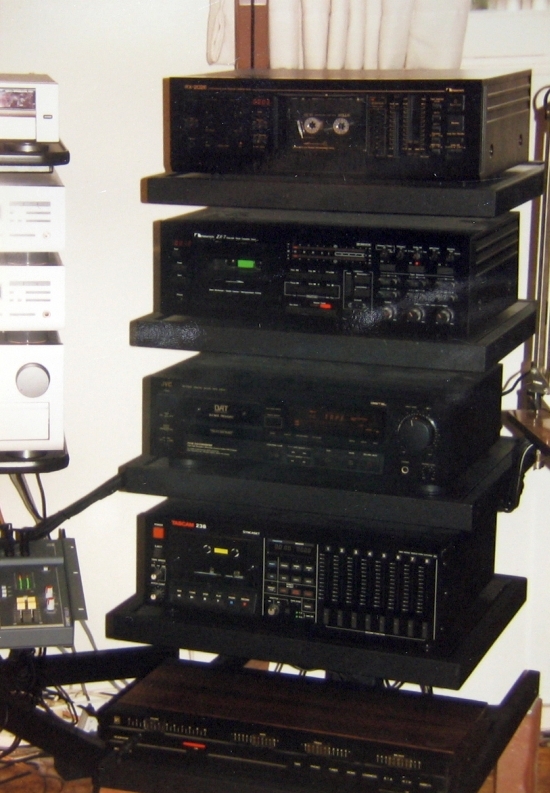 Nakamichi RX-202E, Nakamichi ZX-7, Tascam 422 8 track-recorder, JVC XD-Z505 DAT recorder. 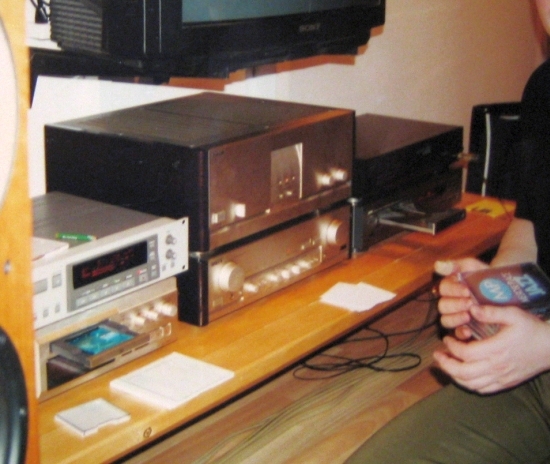 Beautiful and great sounding Sony MiniDisc recorders JA30ES and JA50ES, but neither turned out to be very reliable. This really is scandalous, as my cheap JE500 is still working to this very day (2016!). The JA50ES was repaired twice and then I gave it up. 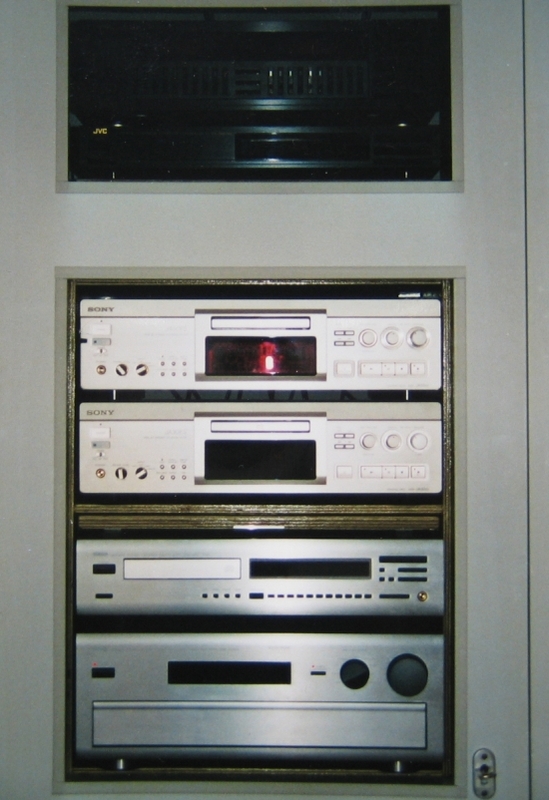 Not visible are the JVC DAT recorder and various VHS recorders along with switching for the other room. The next door houses a noisy PC (early Maxtor HDD’s), monitor and keyboard. Vifa Basis 2.0. 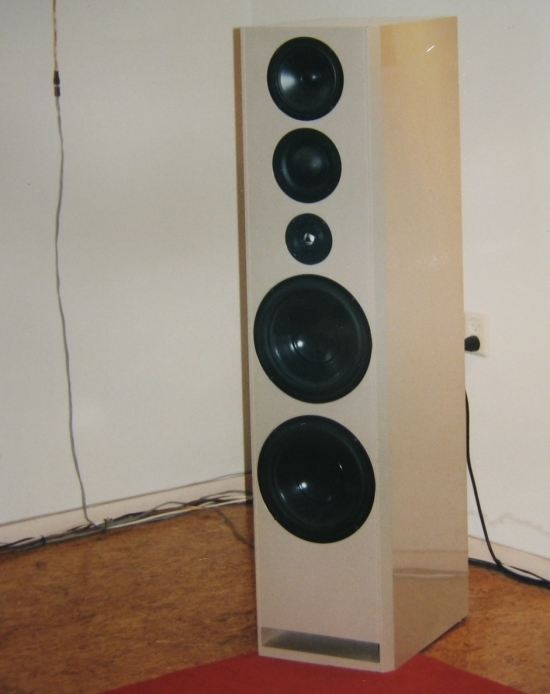 A speaker with very sonorous and powerful bass. As far as I could tell at the time they sounded very good overall, although thet did not sound quite as open as the Vifa Impuls two-ways, and so I opted to retain their aluminium dome tweeters when I traded them in for this demo pair of Basis 2.0. Friends had always been impressed and I had no compaints either. That was until JW came over to visit for the first time and mentioned that the speakers did not have much in the way of imaging or low level detailing. 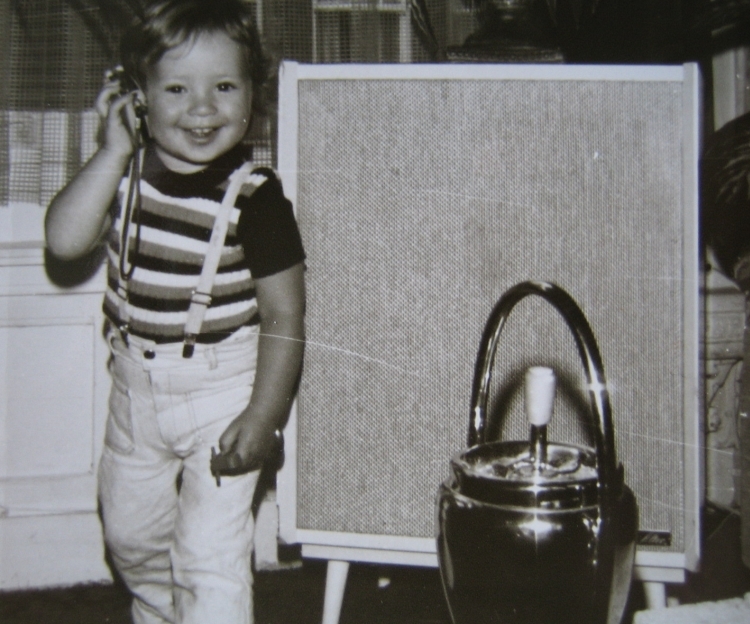 That was when my audiophile career began! My first video projector. 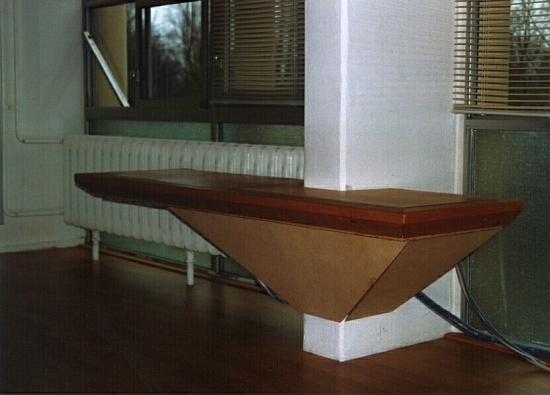 An old Philips CRT “coffee table”. Using the curved and pearled screen, the image really wasn’t bad, but the electronics would not retain the convergence of the 3 beams very well. 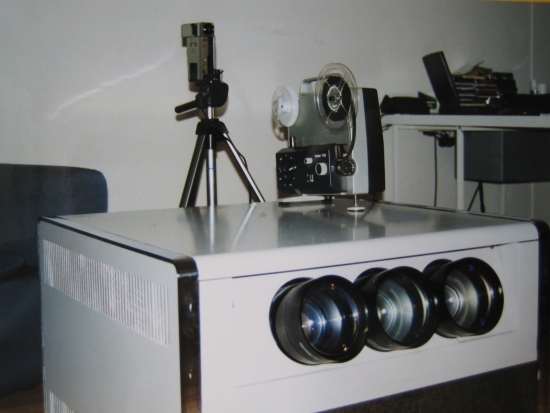 The projector on top and DV cam in the rear were used to transfer some old film footage, which worked remarkably well. Late nineties. The first step in the highend direction: Sony TAE80ES and TAN80ES pre and poweramps feeding my first B&W Nautilus 804 speakers. 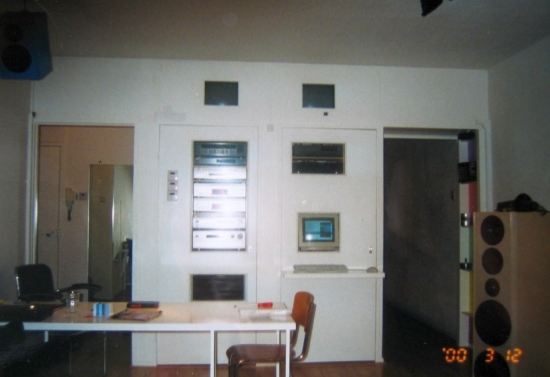 The AV equipment was still in the left wall cabinets. 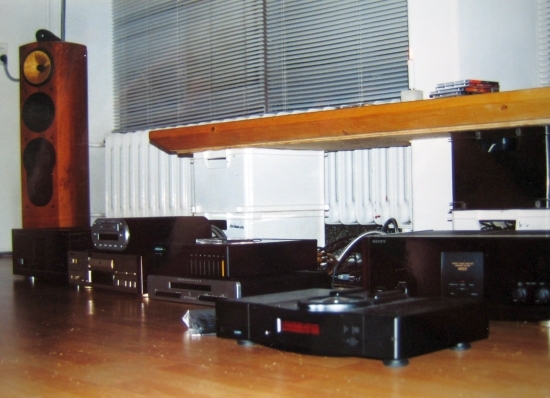 The Sony’s were much more refined and fluid than the Yamaha DSP-A1000. I would later add my first highend cables: Transparent. But this first time the cables were a complete mismatch. I couldn’t have foreseen that later on I would own the complete Transparant Reference Series and be happy with them for years on end. Finished “reverse chimney”, a sturdy audio table that was meant to support a Rega CD player, a Jeff Rowland Consonance preamp and a Sony TAN80ES power amp. Inside I could hide the extension blocks and surplus cable. I had enough of not getting the sound that I wanted. 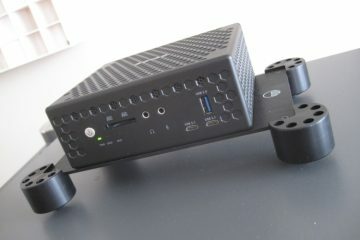 I had tried many, many components with the N804’s but the sound was never completely to my satisfaction. 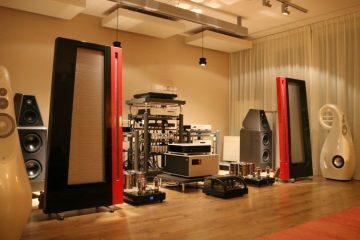 I tried al the following components: Rega Planet and Jupiter CD players and cursa preamp (very very smooth), Meridian 506-24, Sony 707ES with Swoboda modification, van Medevoort PA230, Mark Levinson ML29, Jeff Rowland Consonance, Model 1 and 10, Musical Fidelity X-A100R, Musical Fidelity XAS100, X-Ray and A3CR and many, many more. If I couldn’t have perfect sound, why have so many components? 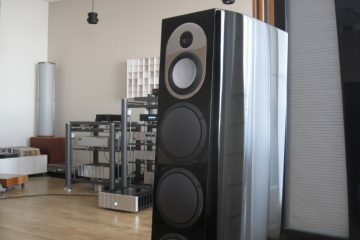 I simplified and settled for a Meridian 551 integrated amp and 507 CD player combined with the same B&W N804’s. 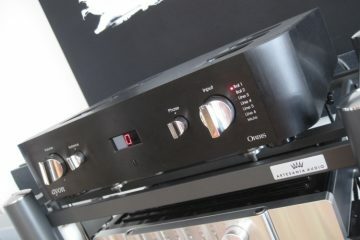 The Jeff Rowland Consonance preamp in the picture was also to be sold. This Meridian setup only lasted for 2 months. Then I started to dive really deep into the highend. Innocence be gone. I tried more Jeff Rowland, discovered Bryston and Wadia and learned a lot. Jeff Rowland model 10: much more refined and natural than the Sony TAN80s, and the Sony XA50ES + Wadia 12 DAC were a huge improvement too, but still it was not nirvana. 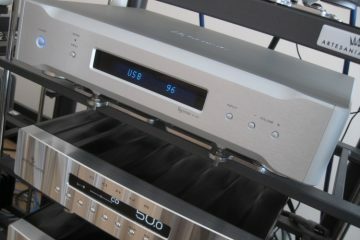 The Jeff Rowland Consonance preamp was replaced with a newly bought Mark Levinson 320S. I had already decided on this model before it appeared on the market and wanted it on looks alone. Well I really learned a lesson then! 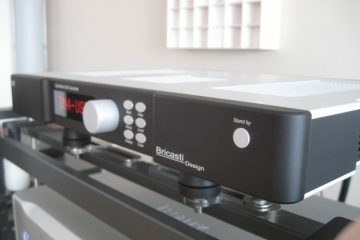 The preamp was 10.000 euro new and because it just wouldn’t sound right even after months of use I decided to sell it again… and lost 3600 euro in the process. That tought me never to buy new equipment unless I’m sure to like it and keep it. At the same time I started having troubles with the Rowland model 10. Its power supply kept crapping out and the distributor could not get it fixed. Finally he sent it to the USA for inspection by Jeff himself, and according to the distributor, Jeff himself fixed the powersupply. But all was not good. 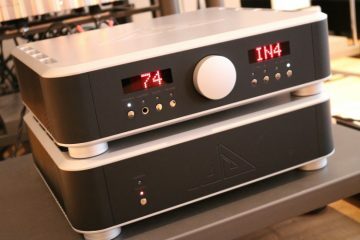 As soon as he handed the amp over to me I felt that it weighed a lot more than it did and upon seeing my face the distributor revealed that the power supply had been changed from switched to linear. Although normally considered to be better, in this case I did not recognise my model 10 anymore. Sure it now had marvellously rich timbre and sounded even more “analogue” or “continuous” if you will, but it had lost its spirit in the process. It now sounded slow and undynamic. So, I made a deal and returned the amp and started looking for something else. Fed up with the overly warm sound I came across a pair of Brystons. I was attracted by their power rating as much as their 20 year transferrable warranty. 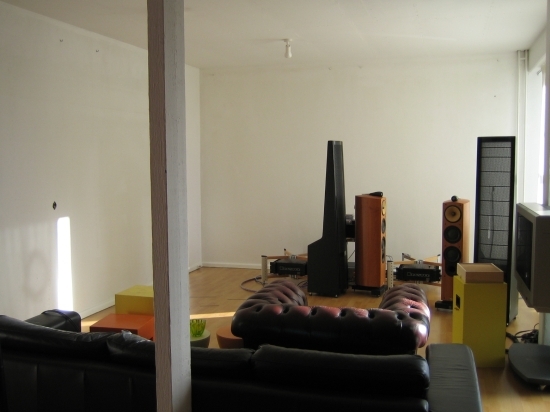 Ultimately the source of my unhappiness with the sound proved to lie with my beloved B&W N804 speakers. I had a very early pair (also bought new when they were just on the market) and I later read that the early samples were notoriously difficult to drive. Also the cabinet wasn’t as sturdy as it would be in later series. 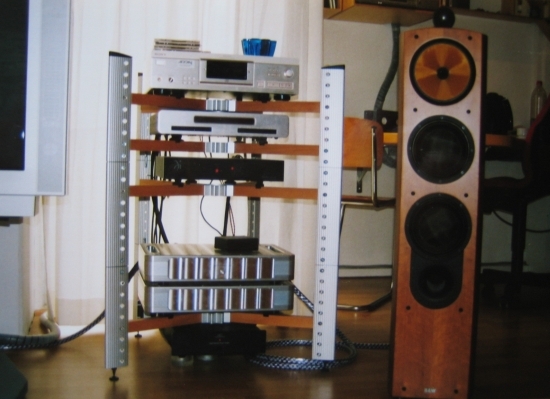 But the Bryston 7BST poweramps I bought around 2004 had good grip on my first 804’s… I would sell and buy a different pair of 804’s again 2 times… This is how I know that there was variation in bass tightness throughout the series. Above you can see the almost “front panel thick” Jeff Rowland Synergy, which at first was not part of my setup. 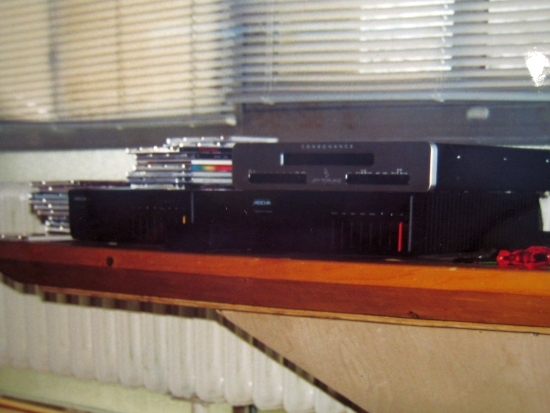 Instead, the Wadia 25 DAC, and later the Wadia 861 CD player, would be connected directly to the power amps. This resulted in a very powerful and controlled sound, which I craved after having lived with an overly smooth sound for too long. 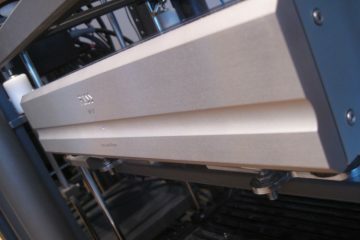 Gradually however I started to long for that super-fuid and ever so subtle sound as is possible with analogue LP. I started thinking about the time when I had a Jeff Rowland Synergy IIi in my setup. At that time its ultra smooth and creamy character did not fit my system well (the Nautili were too coloured themselves) and so I started looking on the second hand market. Instead of a Synergy IIi I found a Synergy I and after a quick listening session in the shop I went for it. First place I took the Synergy I was to JW’s setup. 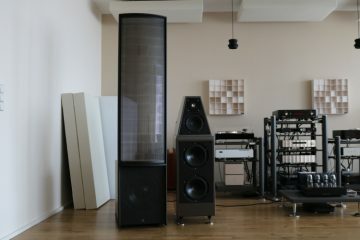 Like me, he had played with a Wadia 861 directly to his power amps and he also longed for more creamyness. His longing had led him back to using the Jeff Rowland Consonance preamp which added the liquidity he so craved but unfortunately also introduced some detoriorations compared to playing the Wadia directly. 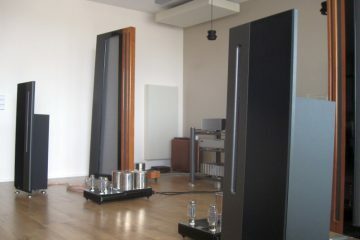 When the Synergy was nicely warmed up we started listening and were amazed at the beauty now present in the sound. There was now so much more subtlety and a much wider soundstage with superb layering where all instruments were surrounded by an amount of space. There was also seemingly (how is this possible?) better low level detail, and more warmth and fluidity. Bass was slightly less prominent now of course but still good enough and most importantly PRAT was unharmed. Although the Consonance had a beefier sound, the Synergy made the Consonance sound rough and low res. I was very happy with my Synergy I and kept it for several years. JW was inspired and got a Synergy IIi himself. The two would turn out to sound quite different from each other. See the Jeff Rowland Knowledge Base on this site for more info.